She's a recent university graduate, a member of the Scottish National Party seeking secession from the United Kingdom, and, as if that weren't enough, the youngest member of the UK Parliament to be elected since the 17th century. 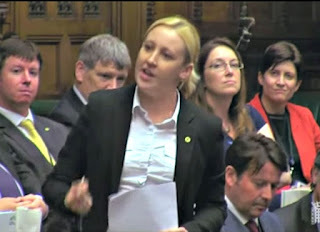 So 20-year-old Mhairi Black's maiden speech in Parliament in July was bound to attract attention. And it was even more famous once she finished, with worldwide coverage and commentary, most of it in the vein of "a star is born." Black accomplished many things in this short, spirited speech. She spoke about the history of her constituency, a traditional part of an MP's maiden speech. She used sly humor about her predecessors' maiden speeches, and about being "the only 20-year-old in the whole of the UK that the Chancellor is prepared to help with housing," after the budget cut housing supports for those under age 21. (Housing is provided for her in London as part of her service in Parliament.) She praised her opponent and predecessor, and held out an olive branch to the Labour Party in aid of forming a stronger opposition to the current Conservative government. And without saying a word he burst into tears. That grown man standing in front of a 20-year-old crying his eyes out, because what had happened to him was the money that he would normally use to pay for his travel to come to the charity to get his food he decided that in order to afford to get to the Job Centre he would save that money. Because of this, he didn’t eat for five days, he didn’t drink. When he was on the bus on the way to the Job Centre he fainted due to exhaustion and dehydration. He was 15 minutes later for the Job Centre and he was sanctioned for 13 weeks. Now, when the Chancellor spoke in his budget about fixing the roof while the sun is shining, I would have to ask on who is the sun shining? When he spoke about benefits not supporting certain kinds of lifestyles, is that the kind of lifestyle that he was talking about? The video of this maiden speech made another kind of history, pulling in more than 10 million views. What can you learn from this famous speech? Every story has a job to do: One of the biggest mistakes speakers can make in telling stories lies in failing to understand that they have a job to do--otherwise, they're just random diversions. Black used the story above to set up and lead into a direct critique of the budget proposals and cast them in terms of real people and real needs from her constituency. That's something any MP needs to get good at doing. Strike more than one note: There are many views balanced in this short speech, and while Black leaves no question about her point of view, she adds acknowledgments, olive branches, praise, and outreach to those who don't agree with her views. The partisan who can also be a diplomat and collaborator can go far in elected office, and she seems to have that figured out early in her career. Use your age to advantage: Far from hoping to hide her youth, Black embraced it and used it to score a point about housing cuts with humor and a fresh perspective. Whatever your age, use it to your advantage when you're speaking. It's part of who you are, and we want to know more about you.